I just went through and reorganized my efforts at labeling posts in this blog. Like most human beings, I am not very good at being 100% consistent and systematic with labeling and tagging, even though it is actually something incredibly important to do in order to take advantage of what a computer work environment offers us. Luckily, this blog is still not very extensive, so with only about 50 posts to reorganize, it wasn't that hard. From past experience, I know that this is really important to do at the outset of a blog because once it grows, it gets really hard to change your tagging system, especially with the not very powerful metadata management options available in Blogger. So, I've reorganized the labels here based on TOOLS (i.e. specific names of specific tools). I don't want to give the impression that I am a tool-driven determinist; I choose the tools based on my goals as an educator, not the other way around. But in terms of labeling the posts, tool names seem like the best choice after all. I was having a hard time of pinning down my goals to simple terms that I could apply the posts consistently. Hopefully this system will work; I'll revisit the decision in a month or so and see how things look. Why are the labels important? As the blog author, I can use labels to manage my content creation and editing process, since the labels are filters you can use in the edit-posts view. I sometimes use labels that refer to stages of the editorial process, for example, to help me remember just how I have used (or re-used) the material in a blog. I often use a pinned/notpinned label to keep track of which blog posts I have pinned in a related Pinterest board, for example, or I use a labeling system to keep track of content I have re-used in my Bestiaria blog, etc. That is not so relevant to this blog which is more or less detached from my other online publishing, but for my other content blogs, keeping track of content re-use by means of labels is incredibly important to me as a blog author. Even more importantly, labels can also help readers of the blog find their way to useful content because there are label links at the bottom of each post and in the sidebar, and I can also create links that point to specific labels (for example: my Desire2Learn posts). Finally, in addition to human users, labels are valuable to computer users as it were. I'm guessing that the use of labels also helps the Google search engine do a better job in indexing content (a hopeful guess on my part; perhaps someone in the know can enlighten me about that in the comments). Since the labels are part of the Blogger RSS file, it means that RSS-driven tools can take advantage of that label information also. The labels show up as category terms in the RSS XML file, and if I actually knew something about RSS and XML (I wish I did! ), I'm sure I would understand more about what that really means for the computers that read XML files and turn them into products readable by us poor humans. That technology, however, is only as good as the human intelligence that goes into the labels (tags, category terms, whatever you want to call the metadata). As one of my goals for my next year, I want my students to become more aware of how tags, labels, etc. can help them in their work and can also help make their work more useful to others. A big part of curation is having a confident and consistent approach to the use of tags (labels etc.) in whatever software you are using that supports tagging. 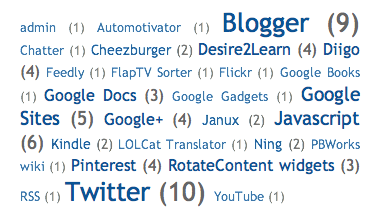 Having the students use Blogger labels, Twitter hashtags, etc. will be a way for me to make that an integral part of my online classes. Well, this blog took a bit of a hiatus, at first because I decided to participate in an open History of Science course offered by my university on their Janux platform, so my "free time" (note scare quotes, ha ha) was going to be dedicated to that course. After a few weeks, though, I realized that the poor quality of the software used for the course platform made it impossible for me to participate in the class; it just was not a good use of my time (details here). Last weekend, I got back into the groove of working on new materials for my students and thinking about better ways to use technology in my own courses. THAT is something exciting, unlike the Janux debacle. So, I'm ready to start using this blog again as a way to record and reflect on those good technology adventures that are happening in my classes. In this post, I'll provide an overview about the different kinds of stuff that I've got going on right now that I'm excited about. I'll do that in terms of the tools because those are the easiest to write about, but the reason I have chosen these tools is because I am thinking about curation and sharing a lot. I want to do a better job of curation and sharing in teaching my classes, and I also want to do a better job of helping my students see curation and sharing as a big part of what they can/should be doing as online learners. Pinterest. I continue to get more and more excited about how I can make Pinterest an important part of my classes. I'll save the details for a separate post, but last weekend I had a real breakthrough about using Pinterest as a kind of portfolio/diary tool for my classes, and I've started keeping a Myth-Folklore Pinterest Portfolio and an Indian Epics Pinterest Portfolio myself, while offering the Portfolio as an optional Tech Tip for my students this semester. My hope is to work on this over the summer and make Pinterest an integral part of my classes starting next fall. Diigo. My efforts to make better use of Diigo to facilitate exploration of the student archive of past projects has really paid off! I rewrote all my Week 2 and Week 3 project planning assignments to integrate more Diigo-tagged student projects from past classes, and also more Diigo-tagged online resources. The results were very positive! Overall, the project Introductions that students turned in for Week 4 were improved over past semesters. So, I now have a big incentive to make even better use of Diigo in the future. I used to keep a really clean, highly structured set of Delicious links; I got started using Diigo in a more haphazard way, but I can not see it is definitely worth my time to work on my Diigo library and be more systematic in my tagging. That will be a big part of my summer. Twitter. I continue to learn more about Twitter, and I am glad to discover that many of my students are already active Twitter users. I'm also learning that they are not necessarily adventurous Twitter users (they don't use lists, widgets, etc. ), so I'm hoping that I can build some class activities that will both help students get started using Twitter as well as expanding the repertoire of students who are already using Twitter. So far, it appears that they are not using Twitter for school and do not think of it as an educational tool. I wonder if I will be able to change that...? Since my own uses for Twitter are educational and professional, I am hoping I can expand my students' use of Twitter into those realms also. There's lots more I could write about, but I would say those are the big headers that describe what I have been up to over the past couple of weeks and which I am ready to start writing about again in this blog. It's funny: I was briefly paralyzed when I realized that the Ning would be gone next year, but thinking about how to adapt to that change has gotten me so energized! I spend most of my good "thinking time" right now (which, truth be told, is shower time for me - I get almost all my good ideas while taking a shower) thinking about what new things I might do with my classes next year! Exciting!